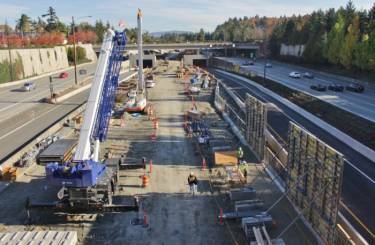 Starting in August 2017 and ending in January 2018, Portland Bolt shipped five separate orders to the Sound Transit E130 East Link Extension Light Rail Project on Mercer Island, Washington. The $3.7 Billion dollar construction project would connect downtown Seattle with surrounding suburbs by constructing a new light rail path with many new stations for an estimated 50,000 daily commuters once the new route opens in 2023. This new route would send the light rail over the I-90 floating pontoon bridge, which is the first time that light rail has be installed on a floating bridge anywhere in the world. Portland Bolt was entrusted by the contractor to manufacture F1554 Grade 55 threaded anchor bolts in diameters ranging from 1-1/2” – 2-1/2” that were hot-dip galvanized by Portland Bolt in our own hot-dip galvanizing facility. These galvanized rods were assembled into four anchor bolt assemblies with a square steel template on top of the assembly and a fillet welded anchor plate made from flat bar that was galvanized. The assemblies were marked and manufactured per different mark numbers supplied by the contractor and shipped to site already fully assembled and ready for use. Portland Bolt worked closely with the general contractor to supply the assemblies in the sequence they would be used on the construction project. In total, Portland Bolt supplied 131 anchor bolt assemblies that had a total weight of 38,294 lbs. All permanent material supplied was 100% domestic and every item was fully certified with full mill test reports for compliance with Sound Transit requirements.